If you like to "space out" while doing lawn work, note that broadcast fertilizer spreaders are easier to use than drop fertilizer spreaders. With drop fertilizer spreaders, you're supposed to line up the guiding arrow on the hopper with the adjacent wheel track you just made in the prior row -- not that easy to discern, unless you have tall grass! Plus I just don't like the level of concentration this involves. I'd rather use a broadcast fertilizer spreader, put it on a low setting and just let the stuff fly! The fertilizer spreader I tested for this review was the Scotts AccuGreen 3000, a drop fertilizer spreader (you can buy the newer version, the 76565, on Amazon). 12-inch wheels make for easy maneuvering. Readily available Scotts fertilizers come with settings for Scotts fertilizer spreaders. 22-inch wide hopper (18-inch for the AccuGreen 2000 model). Hopper arrow (for guidance) should be painted a bright color. Trigger, lock lever and rate setting barrel are plastic and of dubious longevity. Click "Compare Prices" to check on availability; model 3000 not always available. As a drop spreader, AccuGreen's hopper width is important, meaning fewer passes for you. The arrows don't guide so well, as they blend in with the hopper (green). I painted mine yellow, to better define them. Scotts fertilizers are widely available and are sure to come with instructions for use with their fertilizer spreaders. A workaround to counteract broadcast spreaders' inaccuracy: lay tarps down in adjacent planting beds (to catch grass seed). To assure even coverage with drop spreaders, use guide strings to determine where each pass must be made. If you're wondering why the fertilizer isn't coming out, remember also that you must keep the handle squeezed to discharge. Fertilizer spreaders come in 2 types: broadcast spreaders and drop spreaders. Although the generic name references "fertilizer," both types are used to disperse grass seed and other lawn care products, too. With broadcast spreaders, the grass seed, e.g., falls through holes in the hopper onto a rotating disc, which flings it in all directions -- meaning fewer passes up and down the lawn for you! This fact makes broadcast spreaders popular for large lawns. But there's a trade-off: ease of spreading comes at the cost of precision. With broadcast spreaders, you may end up getting grass seed in your planting beds, where you don't want it. I've used 2 types of broadcast spreaders: Scotts SpeedyGreen and an old Red Devil. I prefer the Red Devil broadcast spreader because it's more durable (metal) and I find its mechanisms more straightforward: the same lever used for calibrating (determining how much stuff comes out) is also used for opening and closing the holes in the hopper. Drop spreaders do just as their name suggests, dropping the product straight down, under the hopper. So you have to carefully walk each strip of your lawn ​while pushing your drop fertilizer spreader. Your coverage is only as good as your attention to detail (i.e., your willingness to take advantage of drop spreaders' potential for precision) -- and the width of your fertilizer spreader's hopper. 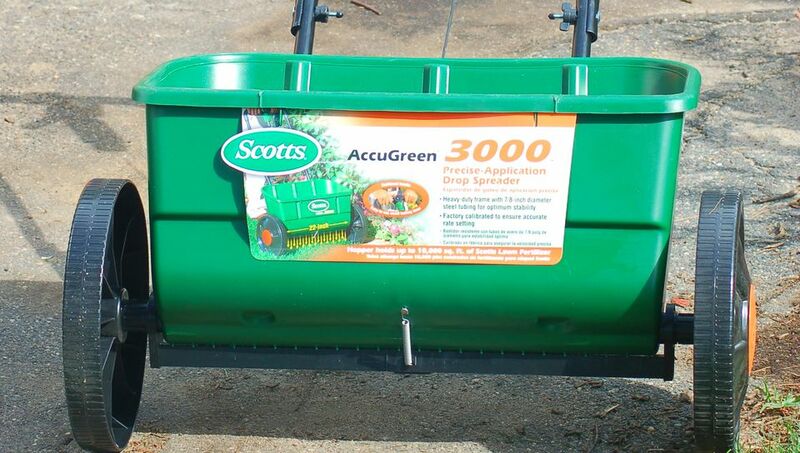 I tested Scotts AccuGreen 3000, which has a 22-inch hopper. For a drop spreader, Scotts AccuGreen 3000 is an acceptable product, but it's nothing to write home about. Its main drawback, as far as I can tell, may be in durability. I haven't owned this drop spreader long enough to make a judgment, but its trigger, lock lever and rate setting barrel are all plastic, and I question their longevity. Update: Two years after I scribed the sentence above, the plastic trigger did, indeed, break. It should be noted, however, that I'm especially rough in my treatment of equipment.